I’m in the Southern Hemisphere aren’t I? Doesn’t that mean it’s summer? I’m not so sure! Anyway, let’s start at 9am this morning, where Kate and I said farewell to Buenos Aires for the time being, checking out of our hotel and making our way to the other BA airport, Jorge Newberry Aeroparque. This is a smaller domestic airport very close to the centre of the city. Our destination? 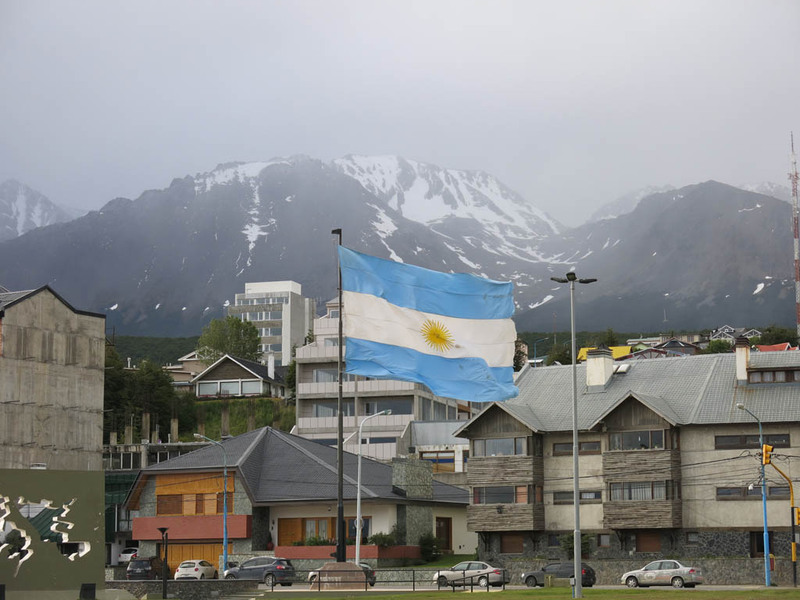 The southern most city in the world, Ushuaia, the start point of our exciting journey to Antarctica. On arriving at Ushuaia Airport, we were greeted by a slight hiccup. We were there, but alas our bags were not. Oh dear. The one positive was that it was not just our bags about about 1/3 of the plane, and the friendly staff knew exactly what was going on and assured us that they would be delivered to our hotel around 9pm. Fingers crossed! But there was no point being upset as they seemed to be on top of it all. 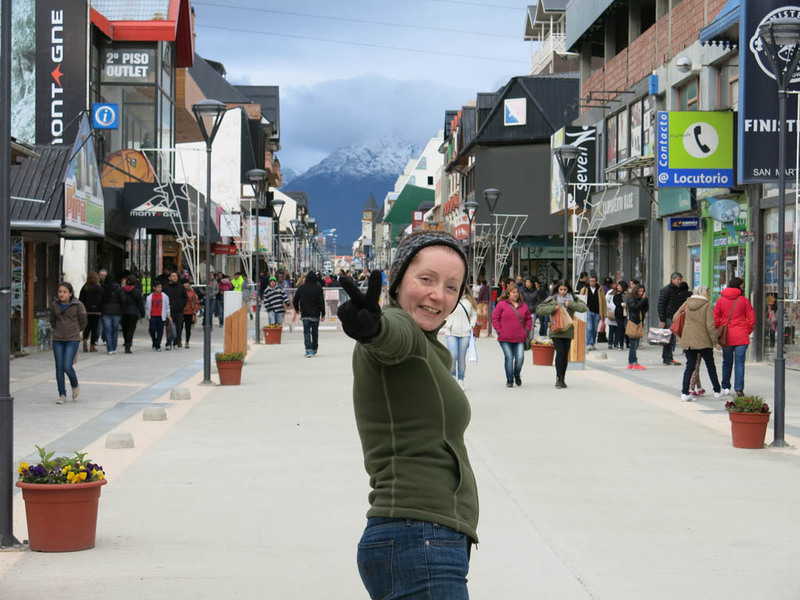 So we met a friendly G Adventures rep at the airport and she whisked quite a lot of us who were on the flight to our hotel in Ushuaia, the Hotel Albatros. It is hard not to think of Queenstown when coming into town. Snow capped mountains in the background, adventure town feel. They seem like sister cities. Oh, and you know how it is meant to be summer? Well, we arrived to a balmy 4 degrees celsius. And no, it wasn’t an out of the ordinary cold snap. That is about normal. That’s what you get for being so far south. Not having our luggage made keeping warm a little more challenging, but we had actually done some prep work, popping beanies and gloves in our carry on. Smart thinking! At the hotel, we met another G Adventures rep, who ran us through the plan for tomorrow… embarkation day! We have the morning to ourselves and have to be back by 2pm, so Kate and I decided to book ourselves on a half day visit to one of the nearby national parks. But that was about all the formalities for the evening, with our welcome packs detailing everything we needed to know. Too easy! So rather than hang about in the hotel waiting for our bags, we hit the streets to see the town. It was interesting that all the shops (tourist stores, or adventure wear) were open until 9pm, but closed tomorrow (being Sunday). Odd given so many people are in town wanting last minute supplies. Regardless, we had everything we needed, so just wandered. The sights to see were simply the natural setting we had arrived to which was spectacular. Aside from the odd quaint church, it was all about the snowy peaks and boats waiting for us in the harbour. Most importantly though, it was also dinner time. Thanks to our Lonely Planet and Trip Advisor, we located what sounded like a good place to eat, Christopher’s Parilla and Cerveza. In we wandered and checked out the menu. More meat! And this time also local microbrew too. Nice choice! Of course we both went steak again. We went for different cuts this time, me choosing the skirt steak. And I chose wisely! Man, mine was delicious! I must say I enjoyed it a bit more than my Don Julio in some respects. Kate’s was delicious too. We also made the mistake again of ordering too much food, also tucking into salad and sweet potato. And being in a house of cerveza, I thought it most appropriate to sample their local beers rather than wine. Since I couldn’t decide, I tired them all of course! And the verdict? The beers were not quite up to the standard of the beef sadly. Not bad, but they have some work to do. With that, we were super full and thought it best to wander back to the hotel. And happily for us, our bags were just arriving at the same time! All’s well that ends well huh? Lucky, otherwise I was going to have to try and rustle up some more warm clothes from somewhere before we set sail. Oh, and this may be the last you hear of us for a couple of weeks. Wooooooooooo! Penguins!